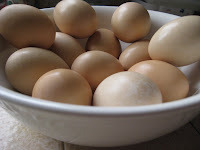 This week my Mom brought us some fresh eggs courtesy of the hens on her property. We used to be so spoiled back when there were more hens and more eggs and we went a full year without buying any at the store... only enjoying the free range organic eggs that she would give us every week or so. One of our favorite stories about Nathan happened when he was about four and we were visiting my parent's house. They'd gotten about a dozen new baby chicks and they were being kept in the front parlor of the house in a small cage with a heat lamp. 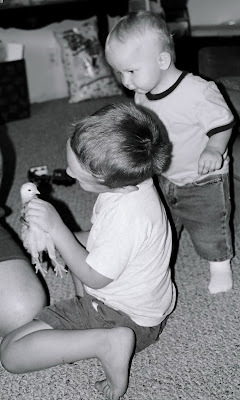 My boys were enamored of these precious downy baby chicks, and wanted to hold them. After they'd both had a turn, Nathan asked where the babies had come from. We said they came out of eggs. He seemed to be okay with that answer. Later we had some scrambled eggs, and Nathan completely freaked out, asking if we were eating scrambled baby chicks. With an overabundance of panic in his eyes and rising pitch in his voice, he asked, "was this a CHICKEN?" We assured him that it wasn't (without going into details about fertilization and such). He kept repeating, "oh no, oh no," while wringing his hands together. He got so upset he finally blurted out, "was this a chicken this MORNING?" 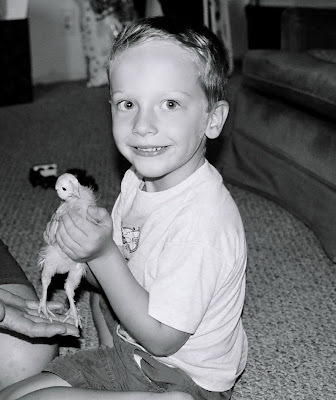 It was hard to keep a straight face and assure him that no, it was never a chicken. He was so worked up that calming him down took quite a long time, and another round of holding the little fuzzy baby chicks. Now whenever our ever so melodramatic son gets a little overly excited about something, either Michael or I will look at each other and say "was it a chicken this MORNING?" and burst into laughter. It helps to diffuse some of the tension that our naturally intense son seems to exude. I think we'll wait awhile longer before letting Nathan in on this inside joke at his expense. Nearly five years later we're still getting plenty of mileage out of it!